I know, I know...I'm very behind in both my reading and blog posts for the year due to a series of family and health emergencies. 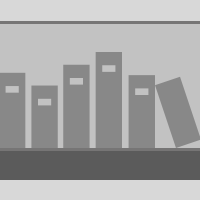 Since it seems to be virtually impossible for me to post reviews on everything that I've read, I'll simply try to provide a brief explanation on what I've read and enjoyed (or not) so far. 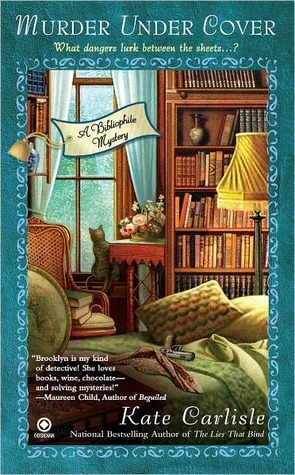 This is the fourth entry in the Bibliophile Mystery series featuring Brooklyn Wainwright. The intrigue begins when Brooklyn's friend Robin hands over a copy of the Kama Sutra to be restored and then Robin's new male love interest is found murdered in Robin's bed. Brooklyn quickly comes to the rescue of her friend and the book while trying to uncover (sorry...bad pun not intended) the murderer and the story behind the mysterious book. This is another great read by Ms. Carlisle. This is the third installment in the Lucy Kincaid series. Lucy and Seth are on a working vacation in the Adirondack mountains. Friends are planning on opening a resort but their property is being sabotaged. The more Lucy and Seth uncover about the sabotage, the more they realize that this quaint small town has more going on than it seems...especially when they discover a dead body in a mine shaft that disappears before outside law enforcement can launch an investigation given the fact that the locals don't seem all that interested. 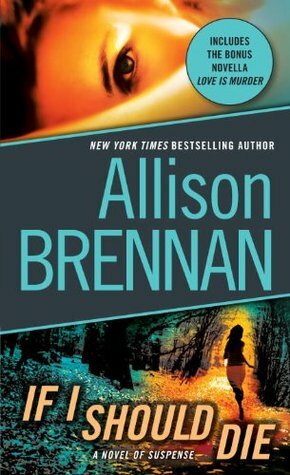 If I Should Die is a fast-paced, mystery that kept me reading and intrigued until the very end. This is classified as a young adult historical fiction read, but I found it to be another great read by Silas House. The action takes place over the course of three months in the summer of 1976. Eli Book is an innocent ten year old boy that seems to be caught up in more drama than he knows how to deal with. 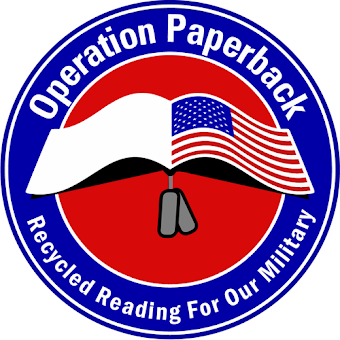 His father is a Vietnam vet suffering from flashbacks and post-traumatic stress disorder, especially at night. Eli's sister is a teenager determined to make her own way, even though most of her behavior constantly antagonizes her mother. Eli's aunt, her father's sister, has moved in and vehemently and publicly protested against the war and that causes a lot of tension in the household. Then there's Eli's best friend, Edie. Edie is dealing with her own drama as her parents are separating. If you haven't read any Silas House books, start with this one...trust me, you won't be disappointed. 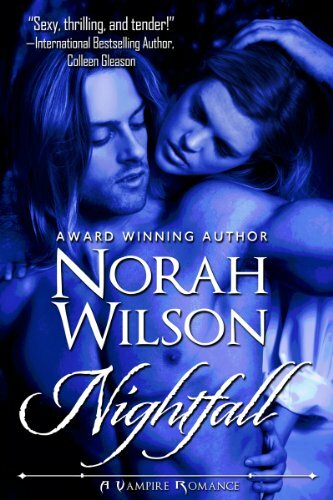 This is the second book in Ms. Wilson's Vampire Romance series. Aidan Afflack is a vampire friend of Dr. Delano Bowen (prominently featured in The Merzetti Effect) and has been sent to Maine on an errand on behalf of Dr. Bowen. Samantha "Sam" Shea is a nature photographer and just happens to be in Maine at the same time as Aidan. Sam provides a paranormal twist to the story in that she seems to intuitively know where rogue vampires will be. Aidan is intrigued by this intuition as well as attracted to Sam. To say that sparks fly in this paranormal romance is a massive understatement. Fortunately, Sam and Aidan team up and help to end the hunting of some rogue vamps. Ms. Wilson provides another steamy and action-filled romance with a bit of tongue-in-cheek humor. If you enjoyed The Merzetti Effect then you'll definitely enjoy Nightfall. 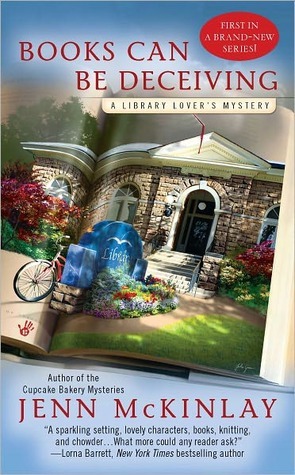 This is Ms. McKinlay's first book in the Library Lover's Mystery series and she started it with a bag. Lindsey Norris is the new director of the library in Briar Creek and just starting to know the community. Beth Stanley, is the Children's Librarian and Lindsey's best friend. Lindsey encourages Beth to submit her manuscript to a visiting New York editor. Beth's boyfriend is anything but supportive and when he turns up dead and the editor accuses Beth of plagiarizing his work, Lindsey is determined to uncover the truth. I initially borrowed this from my public library because the title and cover art grabbed my attention. I can honestly say I wasn't disappointed. 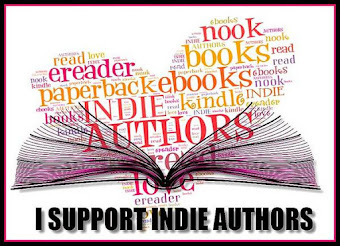 Books Can Be Deceiving may be classified as a cozy mystery but I found it to be a great and fast read filled with interesting characters, gripping intrigue and books. 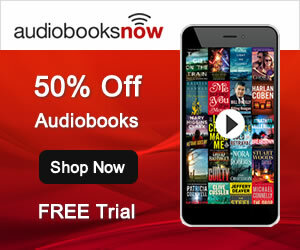 What more can a book lover want? Ms. Mafi has provided an excellent debut novel that incorporates fantasy, paranormal and a bit of science fiction in a YA dystopian romance. Whew! I wasn't quite sure what to expect with this but was pleasantly surprised by how much I enjoyed it. The premise is that in the not-too-distant future, society has fallen and "The Reestablishment" governs with fear and paramilitary force. Juliette is only 17 years old and has been imprisoned for 260+ days because she accidentally killed someone. Her touch is lethal (think Rogue from X-Men). Now "The Reestablishment" wishes to use her abilities to instill even more fear into the society. 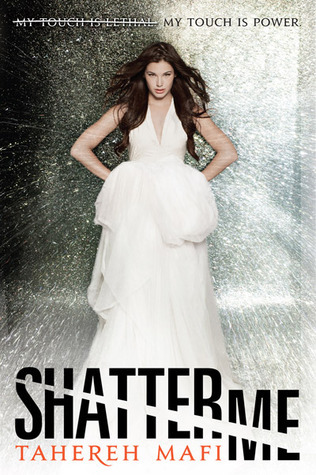 In many ways, Shatter Me is a coming-of-age story with several twists. Juliette realizes that she isn't worthless and finds someone that doesn't think she is a deviant. 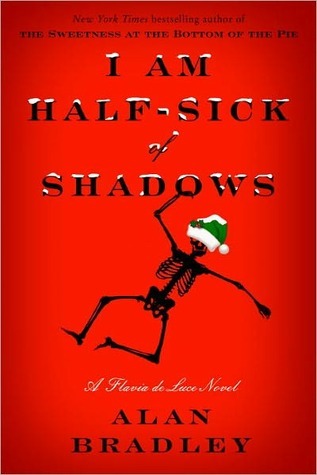 I'm looking forward to the second installment in this series, scheduled for release in Fall of 2012. Flavia de Luce has done it again...or rather Alan Bradley has done it again by providing another captivating mystery featuring the great sleuthing of Flavia de Luce. It is winter in England and the de Luce family is preparing for the holidays by hosting a film company. The filming is one way to stave off the creditors and allow the family to stay in the ancestral home awhile longer. Needless to say intrigue and murder occurs during the filming but with the precocious eleven-year Flavia on the scene all will be revealed. This is another series that I simply love reading. Flavia isn't a typical eleven-year old and not very mature in some respects but it is her lack of maturity mixed with youthful inquisitiveness and scientific research that make her such a wonderful character. This was another book that I wasn't sure would live up to the hype but I was mistaken. 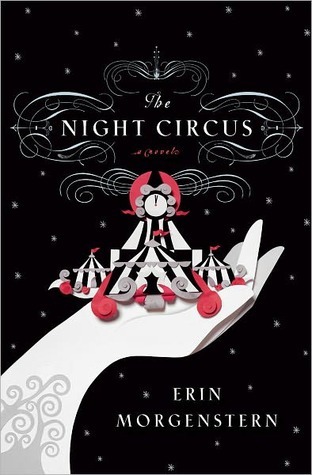 The Night Circus was just as magical and wonderful as I had been led to believe. This is simply one book that has to be read because I find it is impossible to accurately describe without giving away everything. 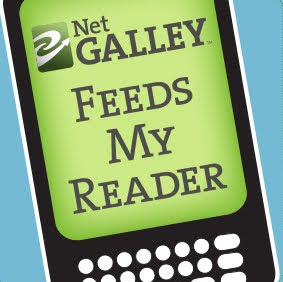 I'll be posting reviews soon for these recently completed books: Kodachrome by Jason Jahns, Three Weeks in December by Audrey Schulman, What Happened to Hannah by Mary Kay McComas, and Twice by Lisa Unger. 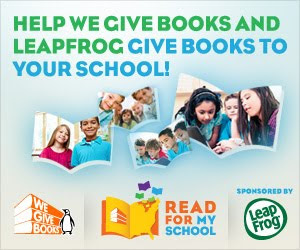 Upcoming reads include: The Ninth Step by Barbara Taylor Sissel, Striking Back by Mark Nykanen, Defending Jacob by William Landay, Accidents of Providence by Stacia Brown, The Garden Intrigue by Lauren Willig, The Healing by Jonathan Odell, Jane Vows Vengeance by Micheal Thomas Ford, and Return to Grace by Karen Harper.